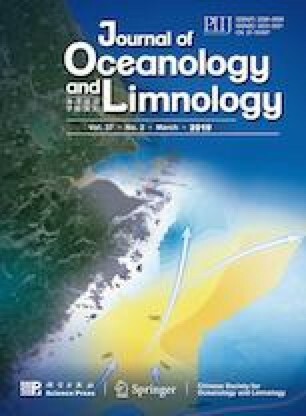 During yellow sea green tide outbreak, the thalli of Ulva prolifera drifted more than 350 km on the sea surface from offshore of Jiangsu Province to Qingdao city, where they were exposed to complex changes of local environments. The purpose of this study is to investigate the response of the thalli to diurnal changes of environments on the sea surface, and a sea surface environment simulator (SSES) was designed to simulate the natural environment of floating U. prolifera mat. A control experiment is designed in the laboratory, which was processed under suitable conditions (20°C for temperature, 72 μmol photons/(m 2 ·s) for light intensity and 30 for salinity), and an in-situ research was conducted to study the photosynthetic responses of floating U. prolifera to diurnal changes of environments. The results show that the photosynthetic efficiency of the thalli decreased gradually with time, and decreased rapidly after 14:00 local time (LT). After exposed to the environment on the sea surface for 6 h, the photosynthetic activity of the thalli decreased significantly. Furthermore, physiological-level and molecular-level experiments revealed that non-photochemical quenching (NPQ), cyclic electron flow (CEF) and energy redistribution between PSI and PSII all played an important role in the strong photosynthetic plasticity of U. prolifera. NPQ is the most important photoprotective responses to environmental changes before 12:00 LT. The results also confirmed that the CEF and energy redistribution between PSI and PSII are the main synergistic effects for the thalli to adapt to the environmental changes when the process NPQ cannot work. And the result can further reveal the reason why U. prolifera can adapt to the living condition of long distance drift on the sea surface. The findings of this research could provide a theoretical basis for explaining outbreaks of the green tide and instructing the management of the problem.